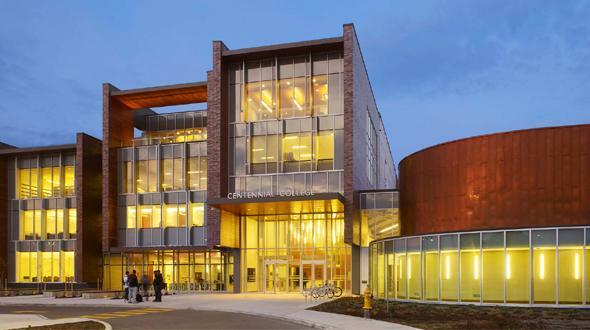 Centennial College is the first government-accredited College in Ontario, with four campuses and eight specialized schools in the Greater Toronto Area. Centennial offers more than 160 certificate, diploma, degree and post-graduate programs, including 90 internationally recognized programs in Business, Engineering Technology and Applied Science, Media and Design, Health and Community studies, Hospitality, Tourism and Culture and Transportation. Centennial offers five joint degrees with universities in Toronto and has credit transfer agreements with universities around the world. The School of Business at Centennial College offers more than 30 nationally and internationally recognized programs; from Business Administration, Financial Planning and Accounting, to International Business Management and Marketing: Sales & Account Management. The School of Engineering Technology and Applied Science specializes in Advanced Manufacturing and Automation Technology, Applied Biological and Environmental Science, and Information and Communication Engineering Technology. Centennial’s School of Transportation is home to one of the largest automotive and aircraft technology training centres in Canada, specializing in Pilot Training, Aviation Technician and Motive Power Technician programs. The School of Community and Health Studies is recognized for innovation and applied research in the area of health care and educational technology for programs in Nursing, Pharmacy, Wellness, Early Childhood Education and Food and Nutrition Management. The School of Communications, Media, and Design at Centennial College specializes in Advertising, Digital Animation, Game Art and Design as well as management programs for post-graduate students in Advertising, Corporate Communications, and Media Engineering Design Integration.